Many years ago I acquired some birdseye figured satinwood. I thought it was one of the most beautiful veneers I had ever seen. Every time I would pull it out and think of using it I would always say to myself, “No, this needs to be saved for something really special.” Finally I had the design that cried out for this veneer. 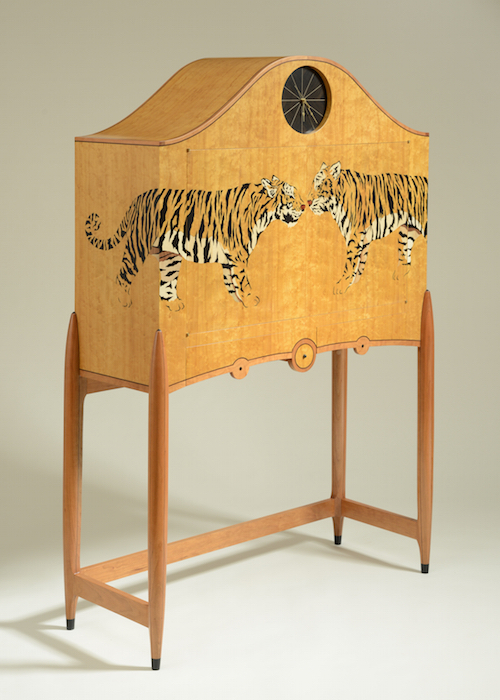 A deco-styled cabinet with tigers. 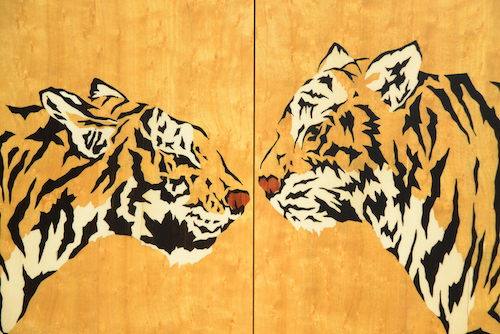 The tigers are stylized and basically done with ebony and holly, using the satinwood as a contiguous plane. (There are a few other veneers used sparingly; bubinga for the tigers’ mouths, a little butternut and walnut for some depth). The tigers wrap around the corners, forcing the viewer to explore both sides. The solid wood is cherry which patinas nicely with the satinwood.